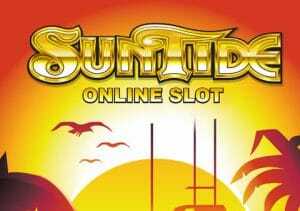 Powered by Microgaming, SunTide is a classic fruity, albeit one with a summery twist or two. Played using a 5 reel, 9 payline game engine, it comes with an expanding wild in the base game and a bonus feature that awards 15 free spins where 3 rows can turn fully wild. Play from between 9p and £22.50 per spin. SunTide has the look of an old school fruit machine – set against a sun-kissed backdrop, the plain white reels include cherries, strawberries, lemons, melons, oranges, bars, bells, 7s and diamonds. 5 diamonds on a payline pay 1,000 times your line bet. The gold coin is the wild and very lucrative it can be too – land 5 of these in a payline and you’ll pocket a massive 10,000 times your line bet. The wild also has some magical properties – when it lands on the middle reel in the base game, it expands to turn the whole reel wild. Things improve still further in the bonus feature. To trigger the Free Spins feature, you’ll need to land 3, 4 or 5 scatters anywhere on the reels. You’ll then receive 15 free spins which are played out on a new set of reels complete with a backing track that sounds like it’s the theme tune to a TV travel show. Instead of the expanding wild being live solely on reel 3, it can expand to fill any or all of the middle 3 reels during the feature! It’s possible to re-trigger even more free spins here too with up to 30 available. This is about as simple a video slot as you’ll find in the Microgaming catalogue – basic it may be but it certainly packs a punch as far as potential payouts are concerned thanks to the 3 expanding wilds in the feature. Wins of up to 3,333 times your total stake are possible which are certainly not to be sniffed at. If you’re after a quick blast of summer when the nights draw in and it’s getting chilly, then SunTide should do the job nicely. Get lucky with those expanding wilds and you could pocket enough gold to get nice trip somewhere warm too! If you like beach themed video slots, I suggest you try Quickspin’s Spinions Beach Party which is fantastic.